"When I first came here I felt hopeless. In a short time, I was able to see the great strides someone can make in just 10 days." Jeff Kostiw first came to Burke in August 2011 when he suffered a spinal cord injury after falling down stairs. He was paralyzed from the neck down. With his determination and the help of the Burke Spinal Cord Injury Rehabilitation team, Jeff was able to make great strides towards his recovery. "The rehab and therapists here are unbelievable, both in the hospital and at the outpatient facility," Jeff said. "I can't say enough good things about Burke." Indeed, he was so pleased with his stay that he came back again in April 2012 after an intrathecal baclofen pump was implanted in his back. "When I first came here, you see patients and they look hopeless, and I was one of them. They don’t realize the strides they can make in such a short time," Jeff recalled. "The second time I came, I was able to see the great strides someone can make in just 10 days. I’m walking and moving around without aid, and I hope to continue improving." 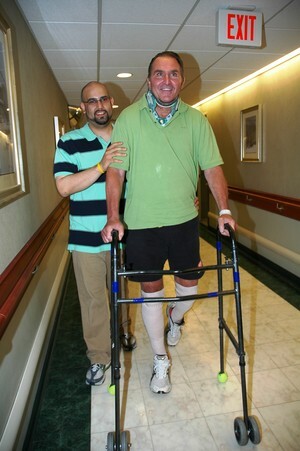 After 10 days as an inpatient, he will continue therapy in Burke’s Outpatient Division in White Plains.